Prof.dr. Ilja Voets of Eindhoven University of Technology (TU/e) has received a TA grant worth almost one million euros from the Innovation Fund for Chemistry of the Netherlands Organisation for Scientific Research (NWO). The Voets team will investigate how proteins and carbohydrates in food can be made visible on a small scale. The modern consumer wants natural and healthy food, produced in a sustainable manner with a small ecological footprint. But not at the expense of taste, texture and shelf life. In order to realize this dream, insight is needed into the relationship between ingredients, structure and function. The localization of ingredients such as proteins and carbohydrates at the interfaces of small drops and in networks of small particles is essential for this. Pictures of different emulsions made with a new super-resolution fluorescence microscopy technique called iPAINT (fig. 1 and 2), and with low spatial resolution (fig. 3). With the NWO grant of almost a million euros, a team of researchers led by prof.dr. Ilja Voets will develop advanced measuring methods to enable this visualization of ingredients on very small length scales. The project is a collaboration between Eindhoven University of Technology (Ilja Voets), Wageningen University (Johannes Hohlbein), Confocal.nl (Peter Drent), Unilever (Lia Verhoeff) and DSM (Lizette Maljaars). 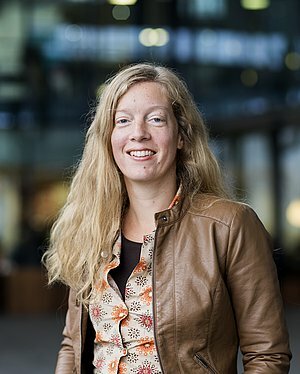 With the grant, three PhD students will be appointed, two of whom will be at Eindhoven University of Technology and one at Wageningen University.